The Stratford-upon-Avon Guild of Weavers, Spinners and Dyers wove a tapestry that is now displayed in Stratford Hospital. This wall hanging was to celebrate the 25th anniversary of the Stratford-upon-Avon Guild of Weavers, Spinners and Dyers in 2000. 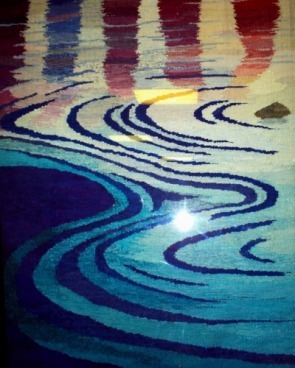 Every member was involved in producing the hand-woven tapestry, using mainly hand spun and hand dyed wool. Each member used the best of their spinning or dyeing skills but it was only realistic for a few weavers to be involved. It was hoped to hang the tapestry in a public space where observers would be passing by or in a seated area. We needed the design to be pleasing and calming in an atmosphere of everyday hustle and bustle yet thought provoking. The impressionistic design, Reflection, was chosen as one that was sympathetic to Stratford and the River Avon and was not intended to be realistic. The small design needed to be enlarged to the final size so that the weavers could work from it. As you can imagine this was quite an undertaking involving many hours of dyeing to achieve the correct colours to match the design, and then enthusiastic spinners to produce the yarn. We did not possess a loom large enough to weave the complete hanging so the chosen design was woven using three separate looms. This sounded simpler than it was; three samples were woven to check the similarity of the woven sections. Matching the colours across the sections was also difficult to achieve as these were being woven in three different places (one of which was Devon as the guild member moved house before it was completed!). The production of the tapestry was slow as it took many hours of work but it was pleasing to see its progress and finally the finished three panels. Only the left-hand panel is displayed above. All the members enjoyed participating in the project and we were delighted when it was agreed that the work would be hung in a waiting room for Out Patients in Stratford Hospital (Arden Street) where plenty of people could view and reflect on it.